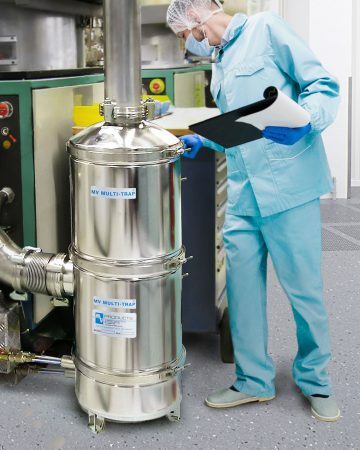 A high capacity vacuum pump inlet-exhaust trap for collecting the heavy particulates associated with semiconductor manufacturing processes is available from Mass-Vac, Inc. of North Billerica, Massachusetts. The MV Multi-Trap 12” Vacuum Inlet Trap features all stainless steel construction and has a first stage knock-down baffle along with two stages of user selectable filter elements to provide optimum filtration. Ideal for semiconductor wafer manufacturing, stacking two can achieve four stages of filtration capable of up to 2,500 cu.in. of solids accumulation, depending upon the process including LPCVD, PECVD, and ALD processes. Easily tailored to a wafer fabricator’s requirements, MV Multi-Trap 12” Vacuum Inlet Traps are offered in several configurations with different port sizes and placement, depending upon the installation requirements. Filtration options include 4.5” and 9” elements made of stainless steel gauze, copper gauze, polypropylene in 2, 5, and 20 micron sizes, Sodasorb, activated alumina, activated charcoal and molecular sieve.